We have experienced and proficient Production Teams that are trained in the latest techniques of Production Management. Our teams interact to provide all of the services needed to produce high quality products quickly. This begins with accurate planning, good execution and immediate follow-up. All phases of production are geared to Lean Manufacturing. Polygon marker making with Poly Nest for automatic layouts. Experience with all types of fabric including Lycra. Low and high ply cutting. Engineered cutting to accommodate patterned fabric. Flexible capacity – day and night shifts available. We have a strong supply chain linked together by long term relationships with our suppliers, reliable sources of production and rapid distribution to our customers. Our company has developed long term relationships with suppliers from all around the world. 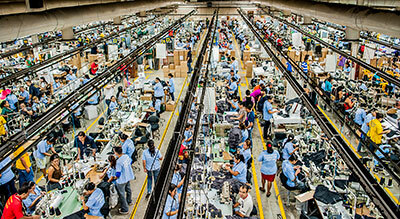 Many international brands maintain warehouses and production facilities in Honduras to service the growing needs of the apparel industry. We also have regional suppliers that have established themselves as top quality producers. Our yarn supplier base is broad so we have access to many types of yarn, including specialty or technical yarns or just the basic 100% cotton yarn. Our yarn suppliers are flexible and can meet special requests by our customers such as the addition of organic cotton. We have solid relationships with some of the biggest yarn producers in the USA. We work through our Fabric Development Engineer located in Honduras, where he has close support from the suppliers. With our customer’s support, we can work with forecasts and guarantee that the required yarns are on hand. New Holland Apparel uses a well established contract knitting mill to convert the yarn. This mill is in an ideal location, only a 20 minute drive from our factories. This mill has ample production and is able to meet any needs that we have. Everything is produced under strict quality and compliance standards. Converting our own yarn gives us better control over the fabric process. We are able to knit only what is needed and control the inventories of goods. We gain great flexibility by keeping the material in the yarn stage so that we can quickly adjust to our customer’s needs. This helps us to be competitive in our pricing. We can gain further flexibility by establishing levels of greige goods that shorten the lead time in production. Producing greige ahead allows us to postpone the color selection to the latest possible moment, giving the customer the maximum flexibility at the minimum delivery time.